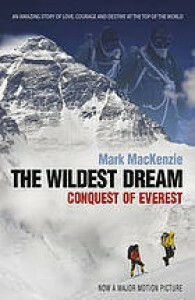 This book follows modern day climbers Conrad Anker and Leo Houlding as they recreate portions of George Mallory and Sandy Irvine's final attempt to climb Mount Everest in 1924 as part of the filming of the documentary The Wildest Dream. The historical portion of this book is mediocre. The Mallory & Irvine story has been covered in many books by this point, and this one unfortunately has several inaccuracies regarding the early Everest expeditions of the 1920s. These seem careless given how much has been written about them. The discussion of Conrad Anker and Leo Houlding's experiences, however, is much better. The background of their lives and motivations for participating in this project are interesting, as is the discussion of their experiences wearing 1920s gear on Everest, and of course their dramatic attempt to free climb the notorious Second Step to see if Mallory and Irvine could have done it.